With all the recent mentions of jiang-hu, Crouching Tiger, Hidden Dragon, House of Flying Daggers and Outlaws of the Water Margin (oh...I haven't mentioned that) in addition to my recent "I'm above all that" Chuck Norris post, some of you out in the "net" may think that I am not a fan of cheezy Westernized Chop Socky. 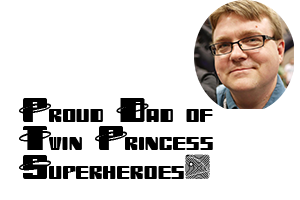 Rereading the Chuck post, I noticed that my genuine enjoyment of his films may have been lost under the sarcastic tone referring to his new novel. I assure you I cut my teeth on Shaw Brothers movies and the Americanized martial arts movie. My middle school afternoons were filled with hours watching USA, HBO, and Showtime presentations of Enter the Ninja ("Neenja!? I want my neenja now! ), Good Guys Wear Black (which had more action in it when originally screened, I swear! ), and Five Deadly Venoms to mention but a few. As I grew, so did my love of the martial arts action film. But there are two Americanized Chop Socky films that stand head and shoulders above the rest in my mind. One from the '80s (the height of the genre) and the other from the early '90s, Berry Gordy's: The Last Dragon starring Taimak and Jeff Speakman's straight forward tale of revenge The Perfect Weapon (only one of which stars the ever present Al Leong). The Last Dragon is the story of Bruce Leroy, a young man in search of enlightenment and full knowledge of the martial arts. His goal is to be as great as his idol...Bruce Lee. He knows that a true master is in harmony both in body and mind and the movie is the tale of his journey of discovery. You see Bruce doesn't believe he is a master because he has not been able to attain a harmonious "glow" when practicing his martial arts. Even skilled warriors are able to attain a glow on their hands, the true master can emit one from his entire body. Thrown into the mix is the Shogun of Harlem, Sho'Nuff, played appropriately over the top by Julius Carry (you may remember him from Brisco County Junior). The Shogun is the obligatory "evil overlord." In a Samurai film, he would be the evil Ronin or the Oyabun's chief assassin. The Shogun seeks fame, power, and the destruction of all who claim to be masters of the martial arts. 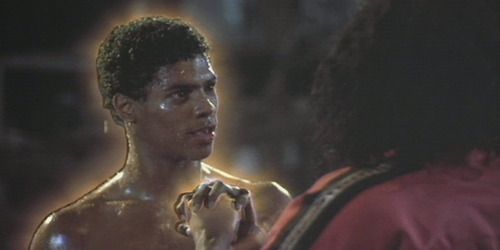 His very reason for existance, in this film, is the utter destruction of Bruce Leroy. Leroy, to give him credit, avoids fighting the Shogun for as long as possible. He delays and seeks non-violent resolution, but in the end he must make a heroic stand. Only to discover that the Shogun, laughable as Leroy imagined the Shogun to be, is capable of achieving enough focus to bring a glow to his hands. How can this villain be a greater martial artist than our hero? The answer is that he can't. Eventually, Leroy comes to understand that he had blinded himself to his own talents and is finally able to achieve a sublime glow covering his entire body. The film is enjoyable both as a comedy and as an action film. It predates I'm Gonna Git You, Sucka by about three years, but like Sucka it plays around with blaxploitation conventions. In fact, I prefer Dragon to the Wayans classic. The Perfect Weapon is an attempt to combine the "bad kid made good through martial arts" narrative with the traditional kung fu trope of revenge. 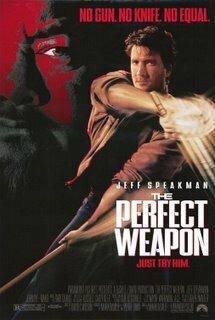 Jeff Speakman, the star of the film, does an excellent job of translating real world martial arts into big screen action. Most, if not all, of the choreography is based on real Kenpo techniques and action is delivered straight without wires or much need for suspended disbelief. The suspension is needed for the narrative, not the action. "Better than expected actioner that was supposed to launch Speakman into a big-time movie career; then Street Knight shot that notion down." Speakman's movie, "The Perfect Weapon," is the first flick that's so true to martial-arts teaching that the body count is only ONE. That's uno! Because, after all, the original idea was self-DEFENSE, right? So anyhow, what's REALLY strange is that kenpo karate looks more like belly-dancing than it looks like kung-fu. You've got all this hand motion, and these arm swings, like Steve Martin doing "King Tut," and you don't really think it's a very MACHO martial-arts technique--until you see Speakman knock out FOUR guys in FIVE seconds. Excellent. Add these two low-budget action classics to your netflix queue as soon as possible.